All the highlights, the fascinating nature, the colourful pagodas and monks’ robes, as well as the friendly population. 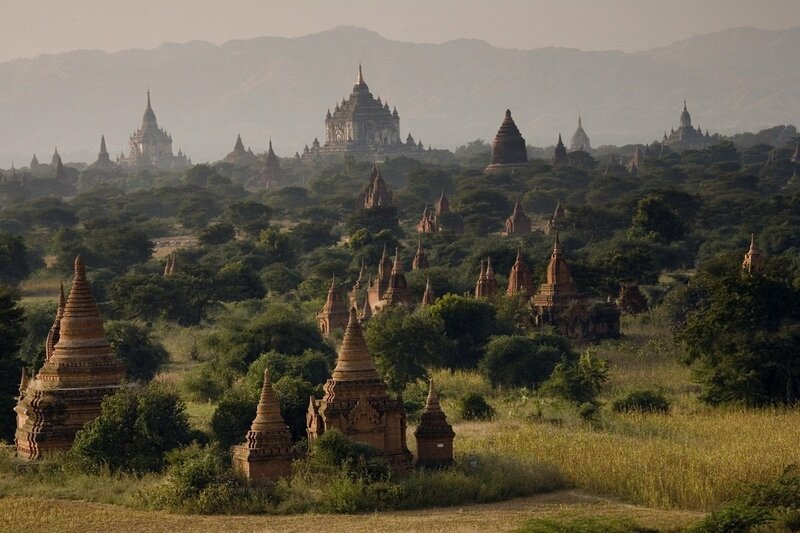 Myanmar is one of Asia’s most beautiful and photogenic countries. The beauty of its nature is undeniable, no matter whether you are looking at the magnificent waterways such as the Irrawaddy River, the expansive, lush plains such as the Bagan Plain or the hills and mountains in the vast forests surrounding Monywa, for example. The colours of Myanmar are what particularly stick in your memory: the unique gold details on pagodas and temples, the burgundy-clad monks, the incredibly verdant scenery and the warm reddish shades of the sunsets. 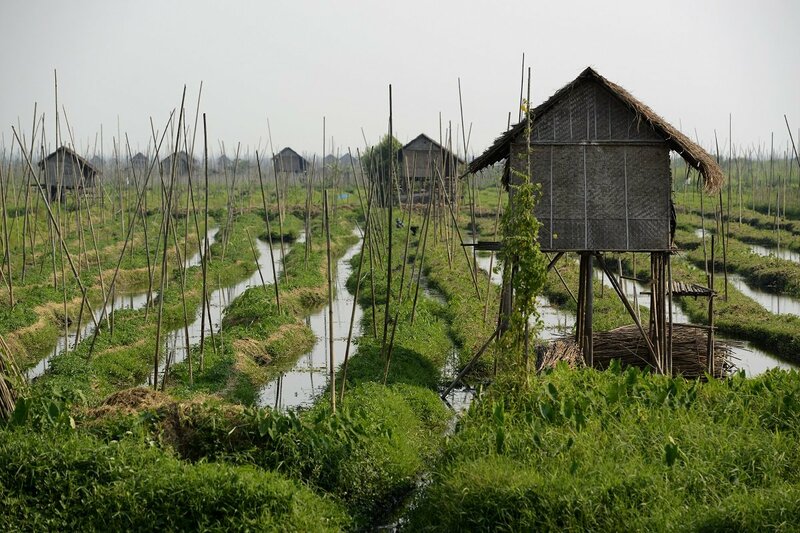 What’s more, you can enjoy the peaceful and tranquil atmosphere, the lushness of the nature, the boats on Inle Lake, the many beautiful old wooden buildings and the chilled approach of the locals when you encounter them with their ox-drawn carts. The importance of religion to the people is seen in the countless pagodas and monasteries located throughout the country. The Buddhist monks are very well-respected by the people. In fact, there is little of greater prestige in the Burmese community than sending one’s son into the monkhood. On this tour, you will experience all the absolute highlights of the country and some extraordinary sights just off the beaten track. So you can look forward to experiencing the best of Myanmar. Departure from selected airport in the UK. There will be connecting flights on the way. You arrive in Yangon, where you pick up your luggage and go through immigration. Your guide will be waiting for you in the arrivals hall, holding up an Asiatours sign, and you will be accompanied to your domestic flight to Mandalay. A guide will be waiting for in Mandalay, holding up an Asiatours sign, and you will be driven to your hotel. Mandalay was the last royal capital of the kingdom of Burma, and the city’s strong association with crafts and religious art is seen in many places. Not only are hundreds of temples and pagodas found here, but also up to half of Myanmar’s Buddhist monks live in or around Mandalay. 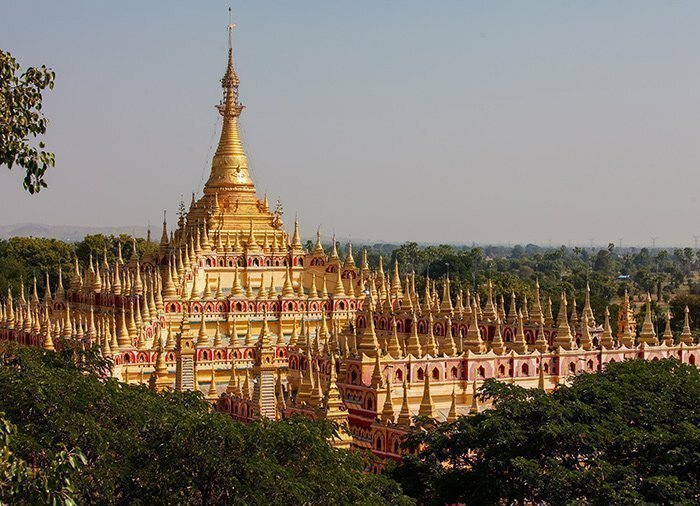 Get right up close to the lifeblood of Myanmar here, both historically and mentally, as Buddhism is deeply rooted in the population. The city’s central location in the country and along the mighty Irrawaddy River have also made it a trading centre for the whole country. 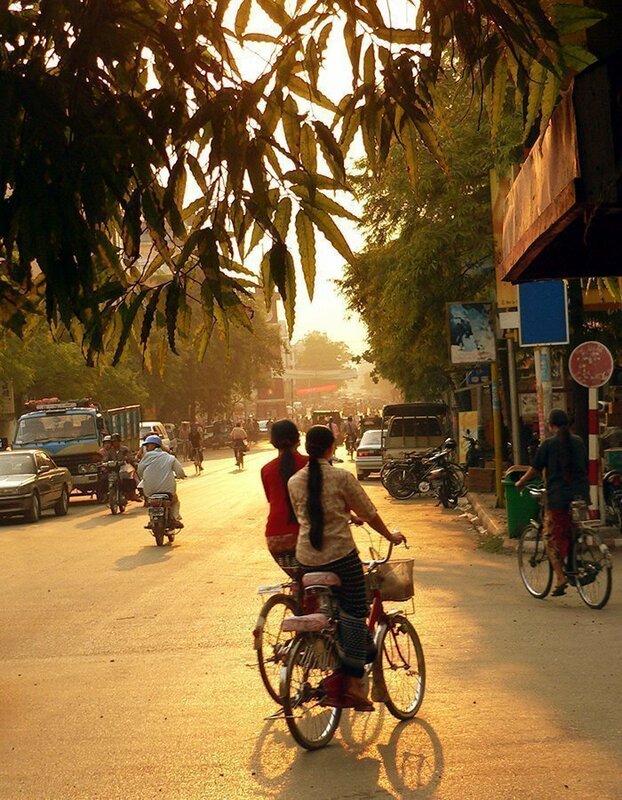 After arriving in Mandalay, you have the rest of the day to explore the city or relax at the hotel. Today, you will experience what Mandalay and the area around the city have to offer. 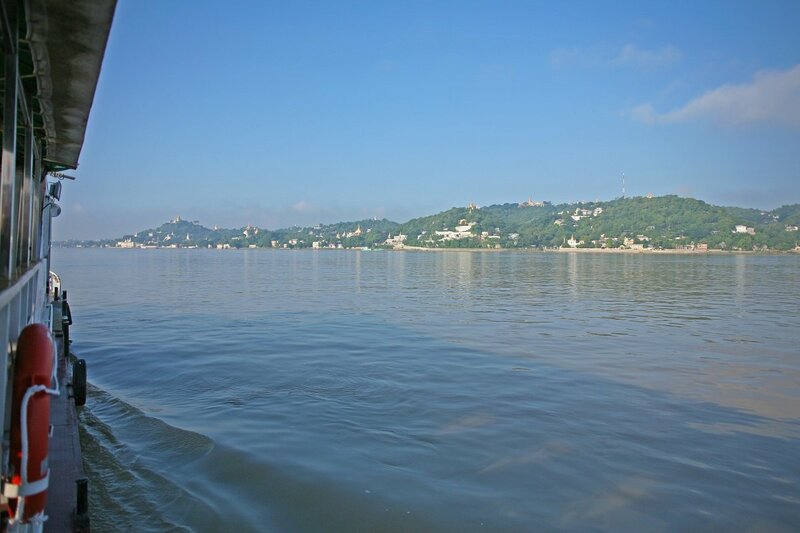 You will be picked up from the hotel and driven to the Irrawaddy River before sailing to Mingun. The boat ride takes about an hour, and along the way, you can enjoy the view of all the boats with their coloured sails and the fascinating landscape along the river. When the local boats dock at the makeshift jetties, which at times are little more than a wide plank from the boat to the bank, you can observe the women rushing forth to sell their wares. 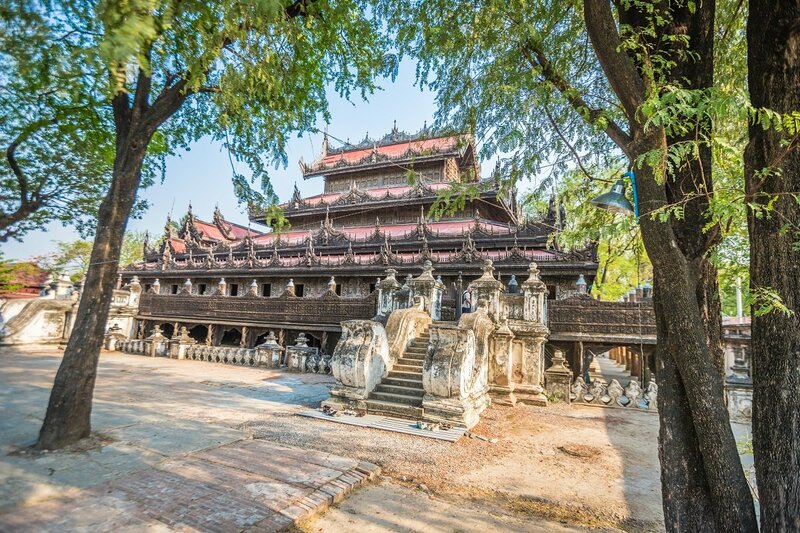 On your arrival in Mingun, you start out with a visit to the unfinished Mingun Pagoda, which King Bodawpaya began in 1790. However, only the foundations of the pagoda were finished as an astrologer predicted that the king would die when the pagoda was completed. Unfortunately, the foundations were destroyed by an earthquake in 1839. Before construction of the pagoda was halted, the bell that was supposed to have been part of the stupa was nevertheless completed. The Mingun bell, a 90-tonne cast iron bell, remains the largest bell in the world to this day. After visiting Mingun, you sail back to Mandalay, where you visit some traditional craftsmen such as the goldsmith, who beats gold leaf for sale as offerings at the temples. You then visit the world’s largest book, Kuthodaw Pagoda, which consists of 729 temples – one for each of the engraved stone sides, which together form this “book”. 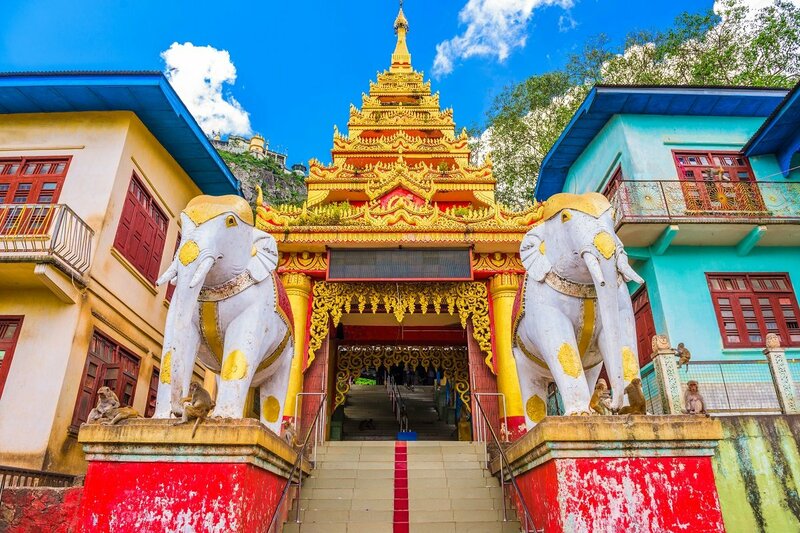 Shwenandaw Monastery, “The Golden Palace”, one of Myanmar’s most beautiful carved wooden monasteries, which was previously covered with gold leaf inside and out, is also on the day’s list of experiences. 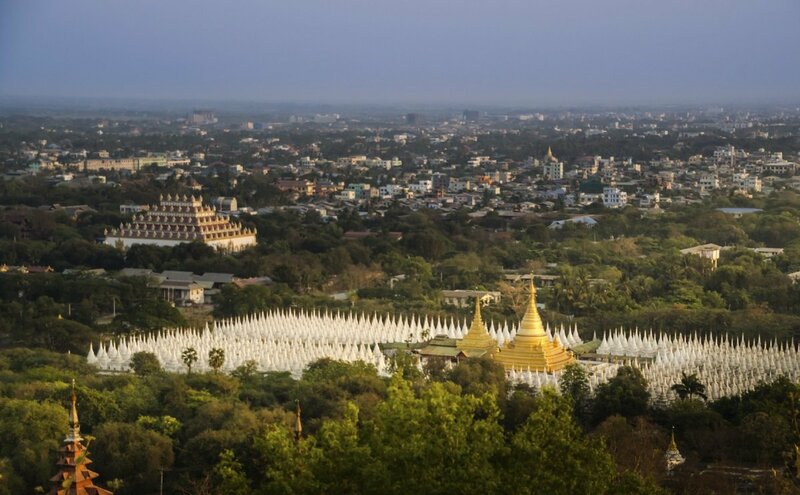 The day ends at the top of Mandalay Hill, where you can enjoy the sun going down over the Shan plain and the city. Today’s experiences start in one of Myanmar’s ancient capitals, Amarapura, which is famous for its silk weavers and the Mahagandayon Monastery. During your visit to the Mahagandayon Monastery, you will experience the everyday life of 1,000+ Buddhist monks, consisting of both studies and daily chores. 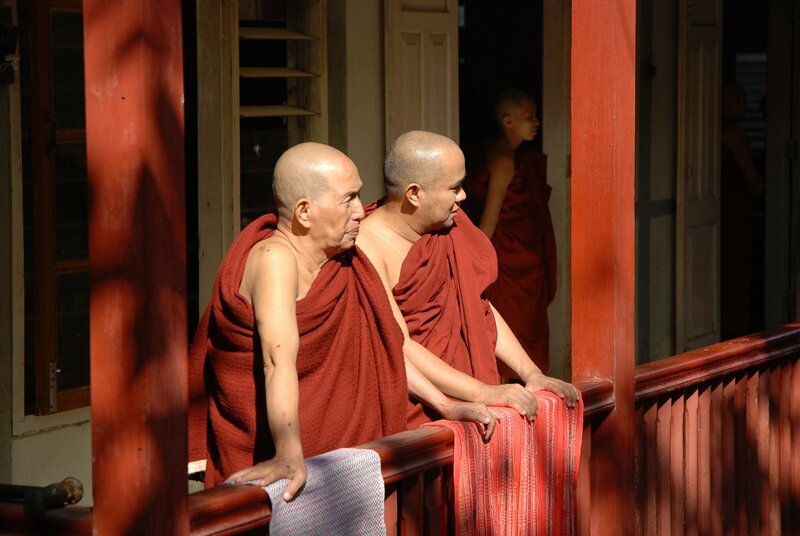 Buddhist monks do not necessarily choose monastery life as a permanent lifestyle, but in Myanmar, being or having been a monk carries great prestige. It is therefore also normal for most men to have lived as a monk for periods – usually at least three months of their lives. For this reason, monasteries also have many novices, so the day is divided into studies in the morning, while the practical chores and leisure activities take place in the afternoon. Most afternoons, you will therefore see boys in monk habits playing football. From Amarapura, you head to Sagaing, which was briefly the capital after the collapse of Bagan. 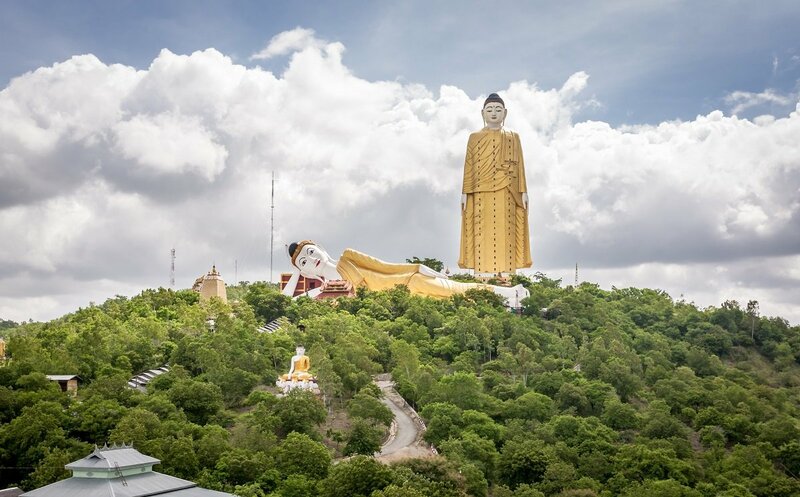 You will visit Sagaing Hill, from which you can see more than 700 monasteries and nunneries spread across the plain in the fascinating landscape around the Irrawaddy River. You then head to Ava, where you will visit Me Nu Ok Kyaung Monastery, the Nan Myint tower and Bagaya Monastery. In Ava, you are transported between the sights in a traditional horse-drawn carriage. 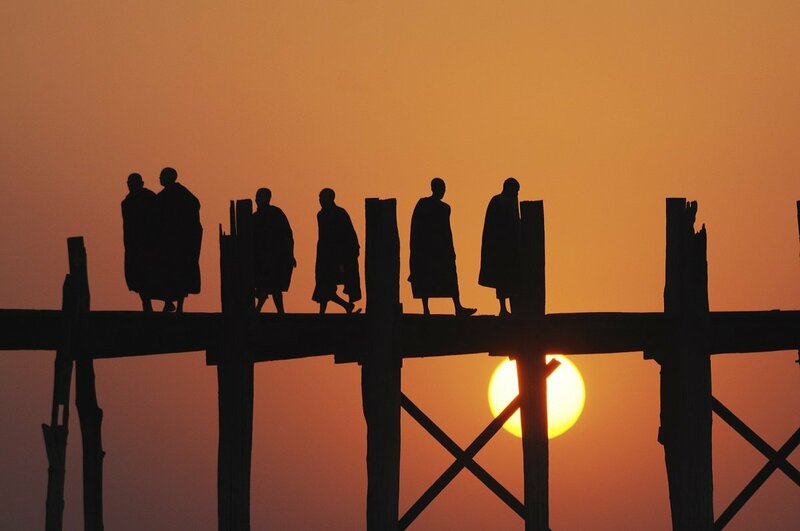 The final experience of the day is back in Amarapura, where you will experience the sunset from the iconic teak U Bein bridge, which is probably Myanmar’s most photographed monument after Shwedagon Pagoda. 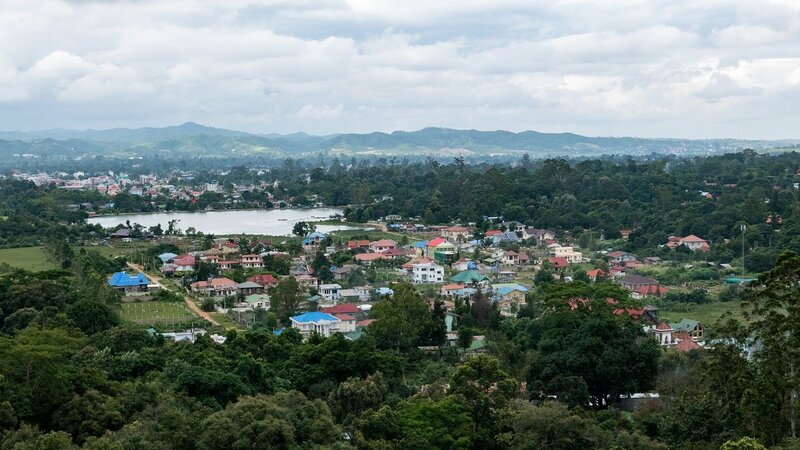 From Mandalay, the tour continues to the town of Pyin Oo Lwin, which was known as Maymyo Hill Station during the colonial era. The town is located roughly 1,000 metres above sea level, and the drive takes around two hours along the winding roads that climb through the Shan Highlands – a scenic and fertile area. 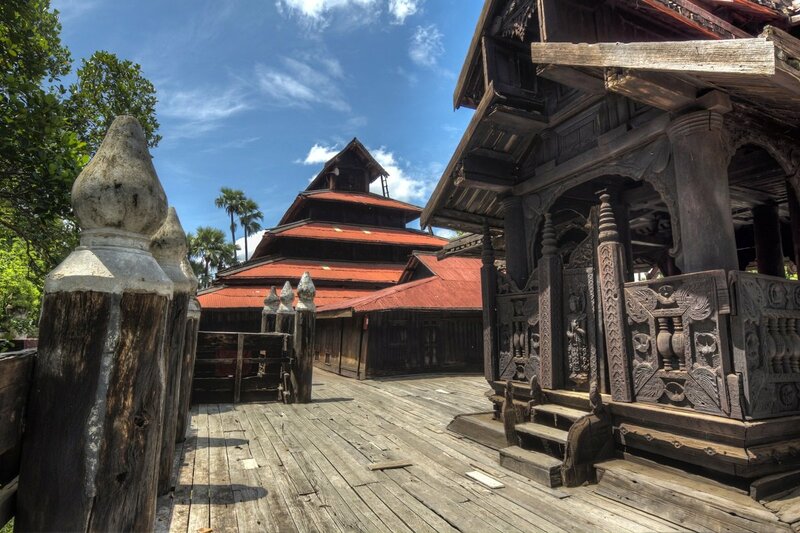 Maymyo was originally established by the British as a military outpost, but the area soon evolved into a place of refuge for the British administration when the melting heat in Yangon became too much in the summer. So the town also has a lot of colonial buildings and a very special charm. The area around the town is green and leafy, while the climate is cooler than on the rest of the surrounding plain. Coffee, vegetables and especially strawberries are grown on the slopes, but there are also plantations where pine, eucalyptus and oak trees grow. 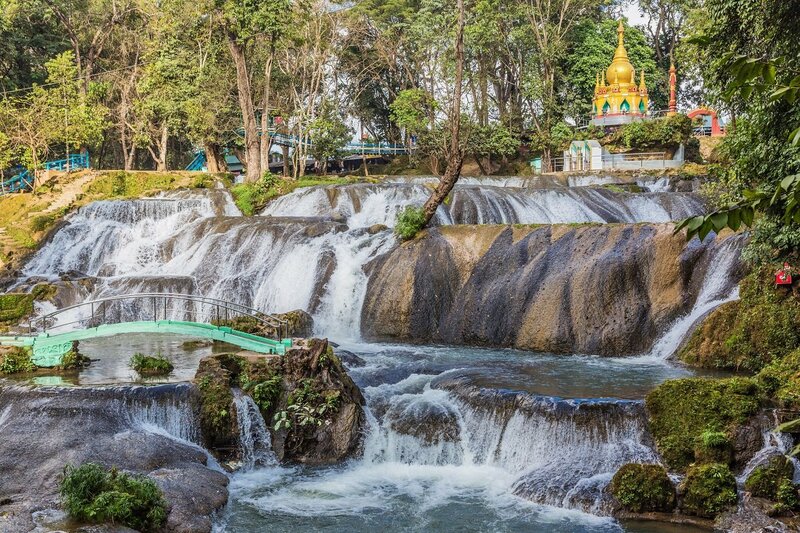 In Pyin Oo Lwin, you and your guide will visit Kandawgyi National Park, the former botanical garden whihc houses a collection of more than 250 different orchids,the Pwe Gauk Waterfall, Peik Chin Myaung Cave and the local market. You can also pay the market an extra visit in the evening or the next morning, as there is a very special atmosphere here at both these times. Come late afternoon, there is nothing more on the itinerary, but we can recommend spending the evening strolling around the scenic parks or exploring the many natural caves in the area. 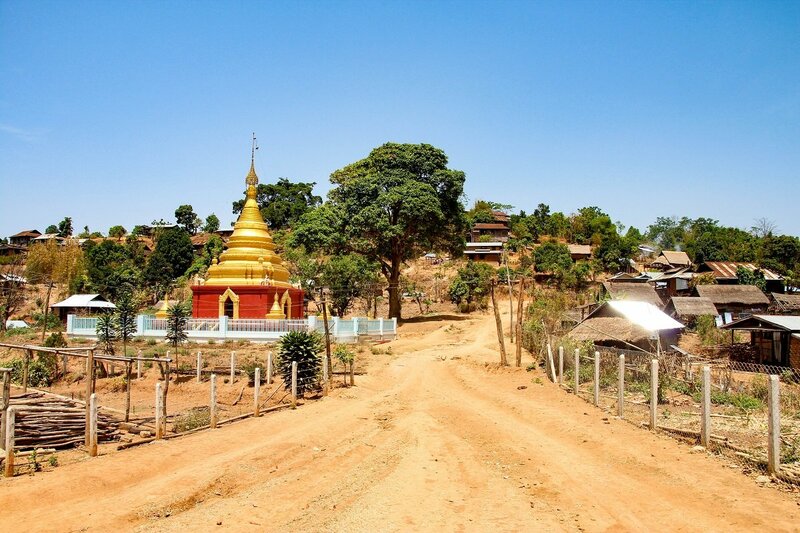 Today, you will visit Kyaukme – a small village located along the railway. You will be picked up from the hotel and driven to Kyaukme, where you will enjoy an authentic glimpse into the lives of the locals. 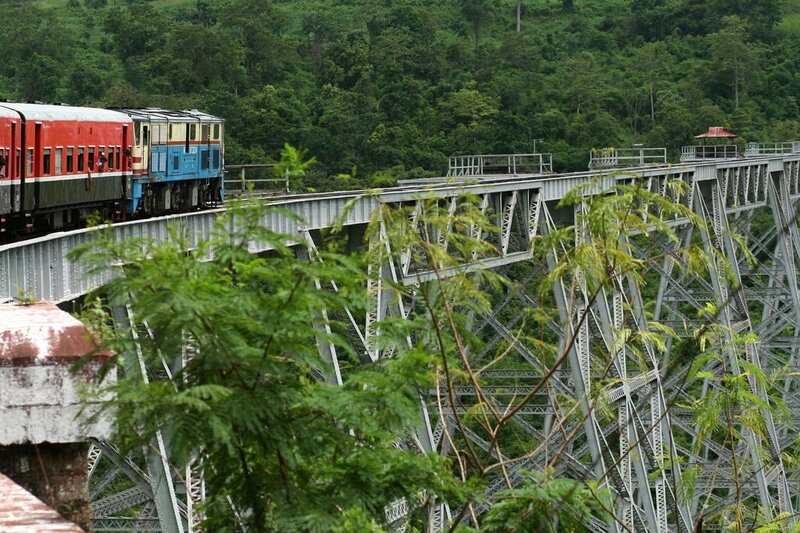 After spending a little time in Kyaukme, you board the train that takes you over the famous Gokteik railway viaduct. The railway bridge is constructed of fifteen steel pillars, each of a height of 12 metres. The bridge itself is 689 metres long, and when it was built in 1899, it was the world’s longest railway bridge. 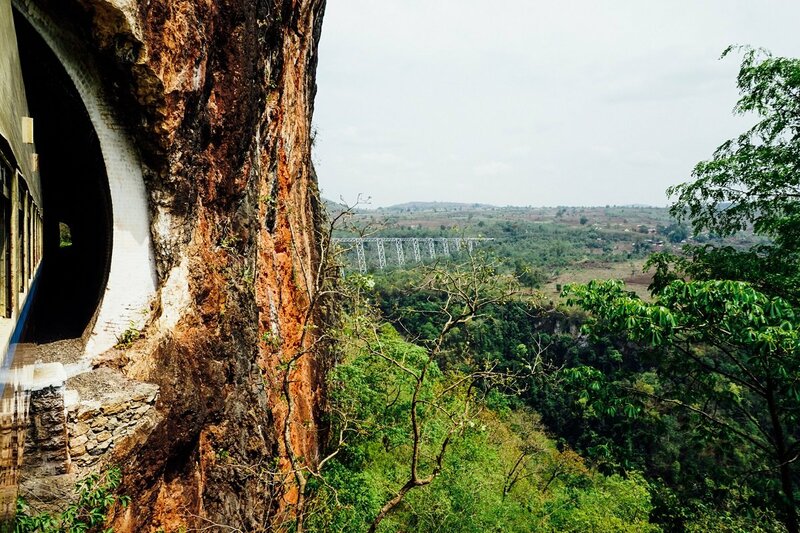 In addition, the railway bridge in the book “The Great Railway Bazaar” is described as a silver-coloured geometric monster, the presence of which between the jungle and rugged cliffs seems bizarre. During the train ride, you will be served a picnic lunch while enjoying the fantastic view of the scenery on the Gokteik viaduct. Be sure to have your camera at the ready throughout the trip, as there is plenty of extraordinary and unforgettable scenery to capture on the journey. Upon your arrival back in Pyin Oo Lwin, you will be picked up from the train station and driven by car to your accommodation back in Mandalay. 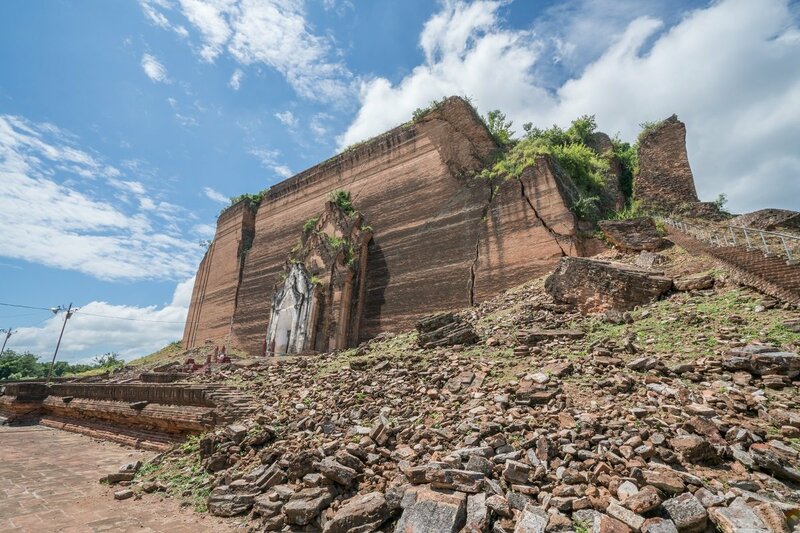 Today, you will head from Mandalay to Monywa – a drive of around 3½ hours. 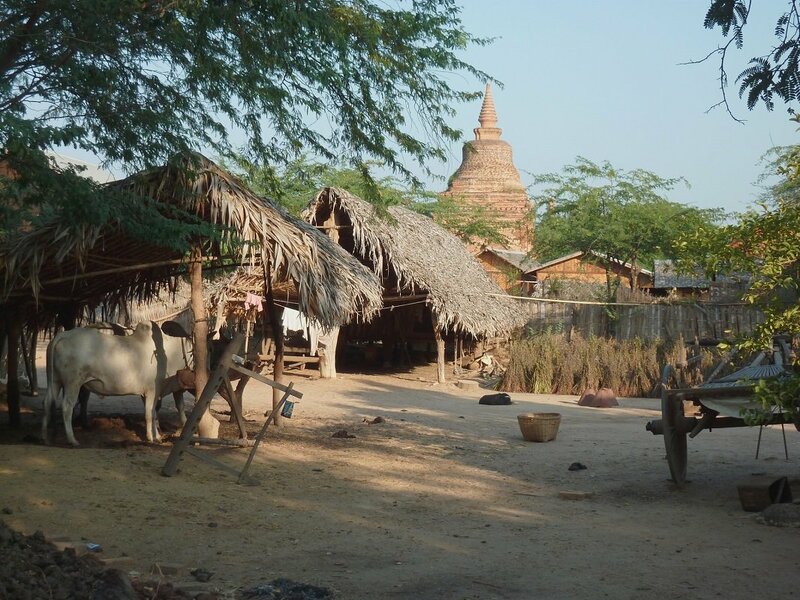 Monywa is a typical Burmese village situated along the Chindwin River. You will drive through one of Myanmar’s key agricultural areas, giving you plenty of opportunity to see how the farmers’ arduous existence produces beautiful crops from the fertile land of the Chindwin Valley. In Monywa, there are many small wholesalers of agricultural goods and mills, where, for example, cotton, corn and cooking oil are produced. 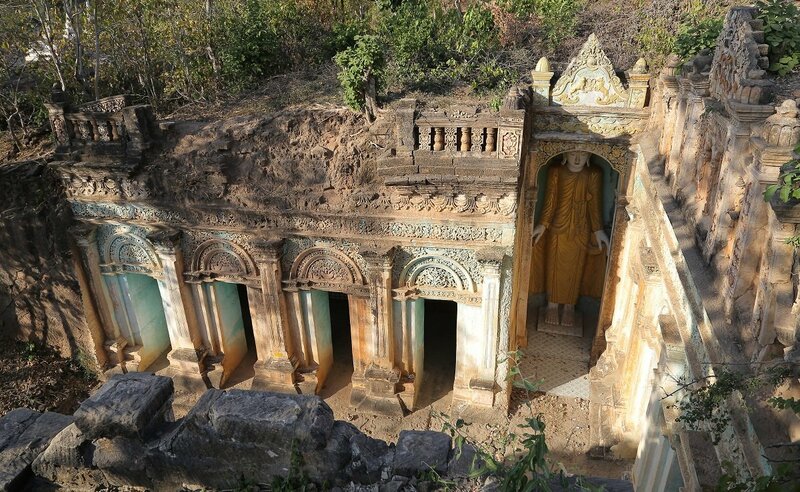 Along the way, you make a stop at the Phowintaung caves – a remote complex located on a mountainside, which houses more than 500,000 Buddhas, spread between 900 small caves. 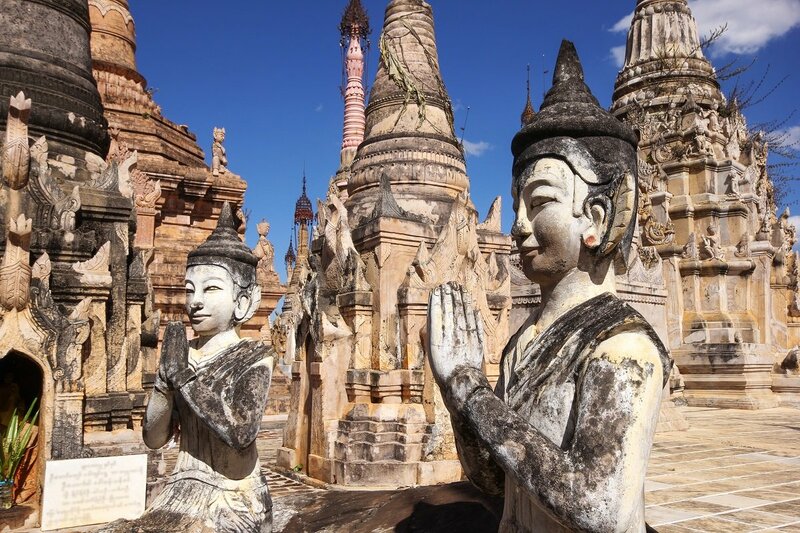 You will also visit the spectacular Thanbode Temple, the central stupa of which is surrounded by 854 smaller stupas, as well as the Bodhi Tataung Temple with the world’s second largest standing Buddha surrounded by the sacred Bodhi Trees. The driver will also be happy to make additional stops at other fantastic pagodas and temples if you spot something of interest en route. You will be driven to Myinmu, which is located on the Irrawaddy River. Here, you will wave goodbye to the guide and sail to Bagan, where you will be met by a new guide. You are on your own on the boat ride, which takes most of the day. The Irrawaddy River is formed from meltwater from the Tibetan Highlands, where the smaller rivers N’Mai and Mali meet. The river is known as both Irrawaddy and Ayeyarwaddy. 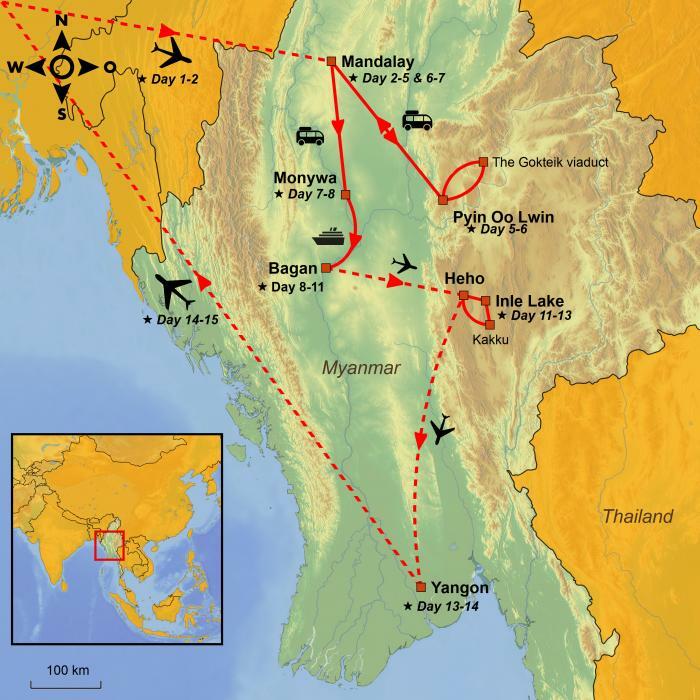 It is Myanmar’s main waterway and close to being the country’s main trade route. Throughout history, rice, cotton, fish and, not least, teak have been transported from northern Myanmar to the Andaman Sea in southern Myanmar. 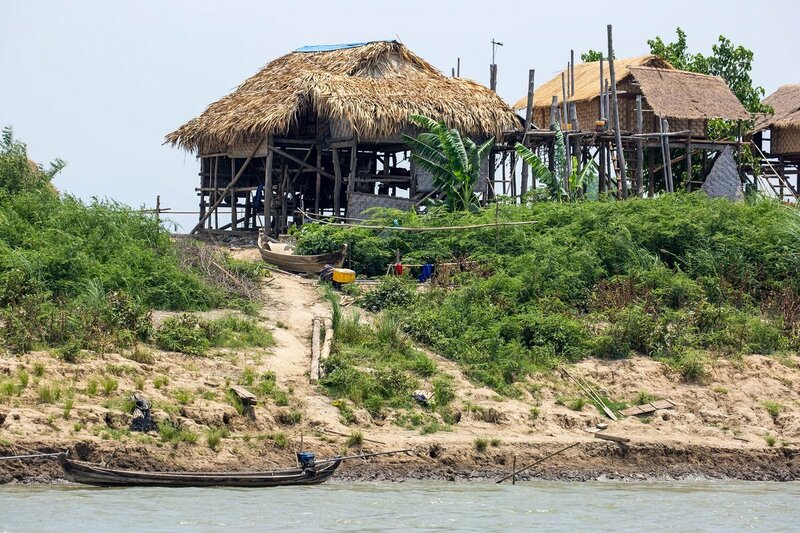 However, the Irrawaddy River is not only an important transport route; the river’s water is also vital to the farmers on the plains south of Mandalay, where the water is used for the irrigation of vegetable and rice fields. 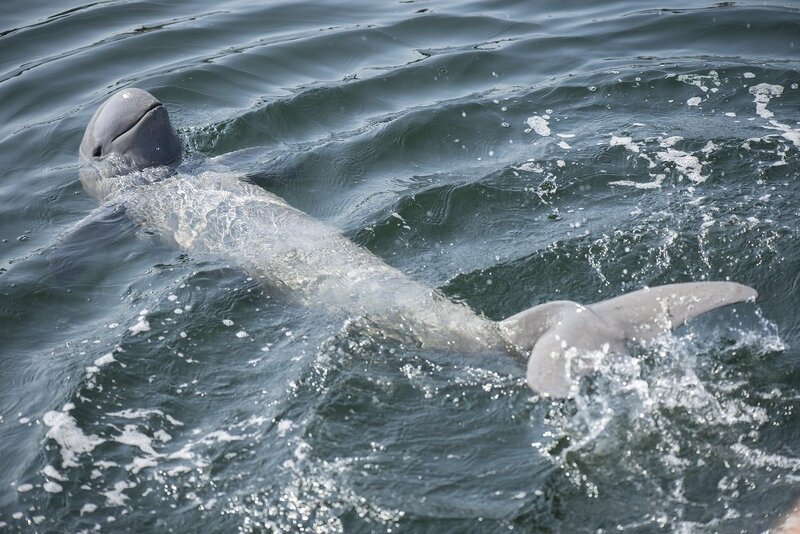 Irrawaddy is also home to the rare Irrawaddy dolphins and Irrawaddy sharks – you might even be lucky enough to spot them on the sailing trip. Along the way, you will experience life along the river. When the boat docks in various places, the local women come to the quay or the banks to sell their wares, which can be anything from refreshments to small hand-carved wood items. When the boat arrives in Bagan, you will be met by the new guide, who will take you to the hotel where you will be staying over the next few nights. 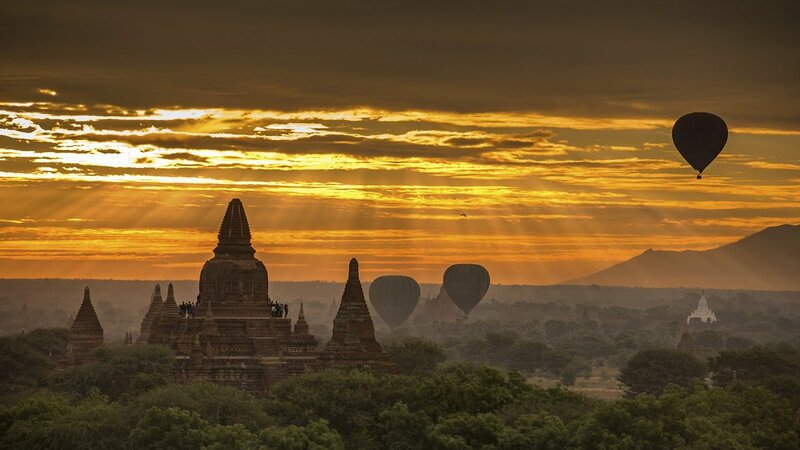 Bagan is one of Myanmar’s most breathtaking experiences. The city was the capital of the first Burmese kingdom and is located along the Irrawaddy River. In its heyday, around 1,000 years ago, the city extended over an area of more than 40 km² – a size that corresponds to a reasonably large city today, but which back then was incomparable with similar cities. 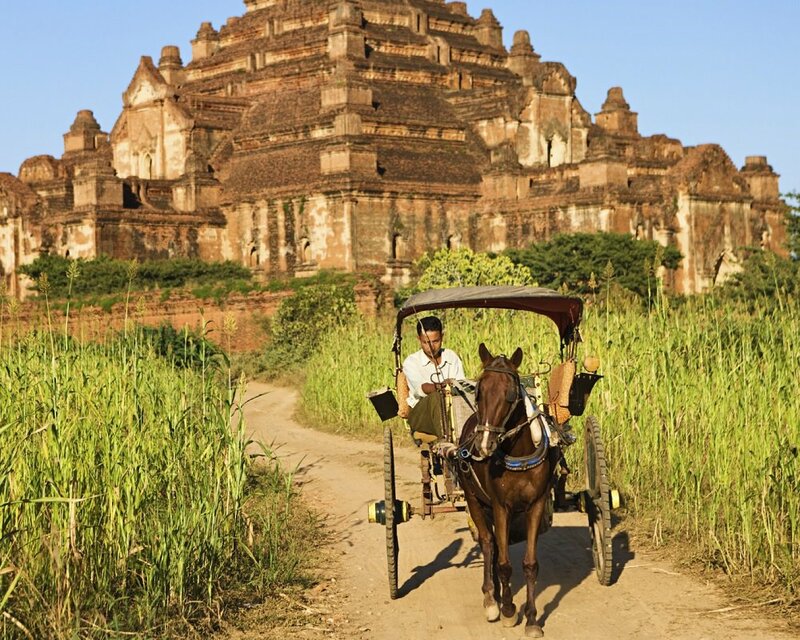 Today, Bagan is just a small provincial town, but you can still sense the immense wealth of the ancient city when, in the soft light of the sunset, you stand atop a pagoda or temple, looking out over the Bagan plain and the hundreds of towering spires of the religious buildings. The area, which is home to more than 2,000 religious temples and pagodas, became a UNESCO World Heritage Site in 1996. Sadly, time, not to mention numerous earthquakes, has destroyed many monuments, but the authorities are doing their best to restore the most important ones. On the dusty dirt roads all over the plain, the local farmers transport their produce to and from the markets in their ox-drawn carts, while the tourists are transported around in horse-drawn carriages. Today you enjoy the unique experience of the hospitality of the locals and life in Myanmar, when you are invited into the home of a local family where you can help with the preparation of lunch. Your host will tell you all about the various traditional dishes. If you’re lucky, lunch will include seasonal, home-grown vegetables. The preparation of lunch takes around two hours, after which there will, of course, be time to enjoy the exciting dishes. 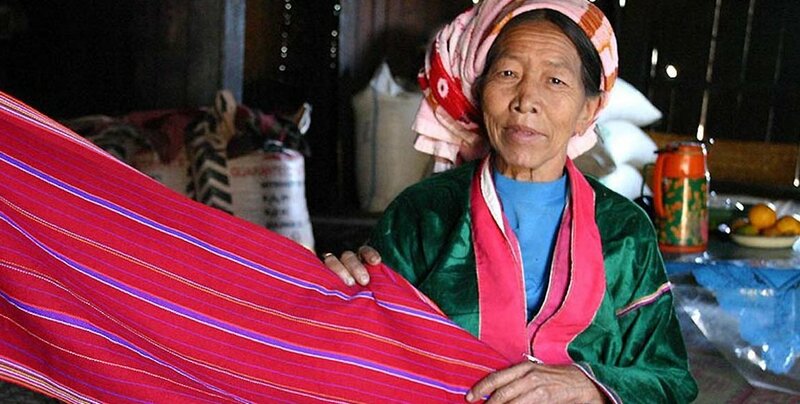 You will then visit a colourful local market and the local lacquerware factory, which manufactures the most beautiful, completely smooth lacquerware unique to the Bagan area. 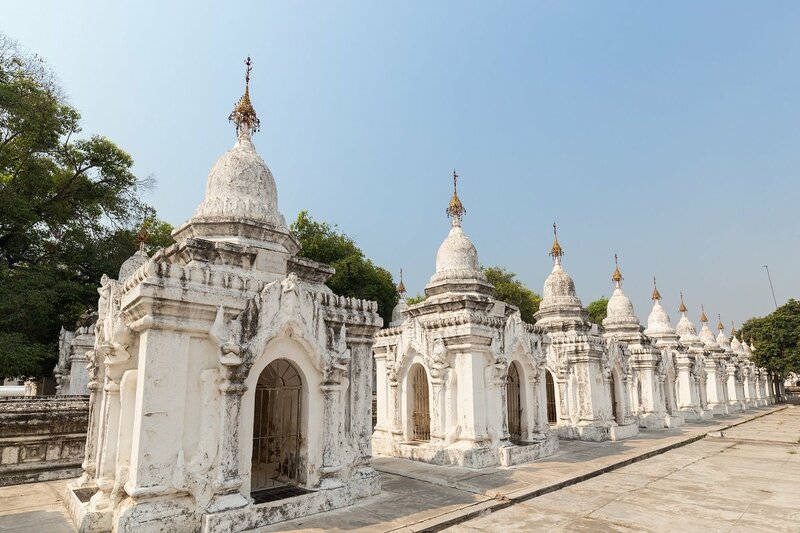 Out on the Bagan plain, you will also visit Shwezigon Pagoda, Ananda Temple, Dhammayangyi Temple and the unique Taung Kyaung Nat Taung monastery, which is built in teak. The day rounds off at the top of a temple where you watch the sunset enveloping the magical landscape in its soft, red evening light. 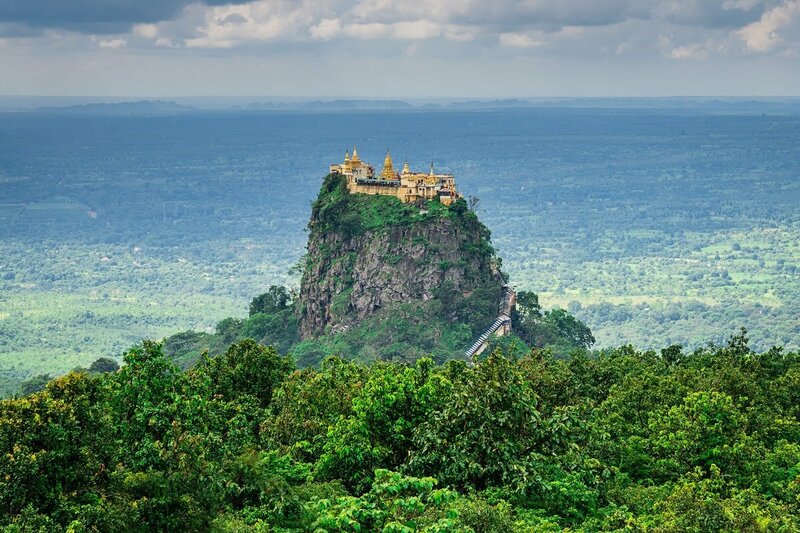 Today you will visit Mount Popa – an extinct volcano which stands pronounced and majestic, like a column in the flat landscape. The gold-plated temple complex at the top of the mountain rises around 1,500 metres above sea level, and there are 777 steps from the foot of the mountain to the top. When standing on top of the mountain, which is also known as “The Home of the Nats (spirits)”, you enjoy a formidable view of the otherwise totally flat landscape. In the temple complex, there are several different temples for particular spirits believed by the praying Burmese Buddhists to reside here on Mount Popa. This particular belief in the spirits is one of the points where Burmese Buddhists differ from other Buddhists. 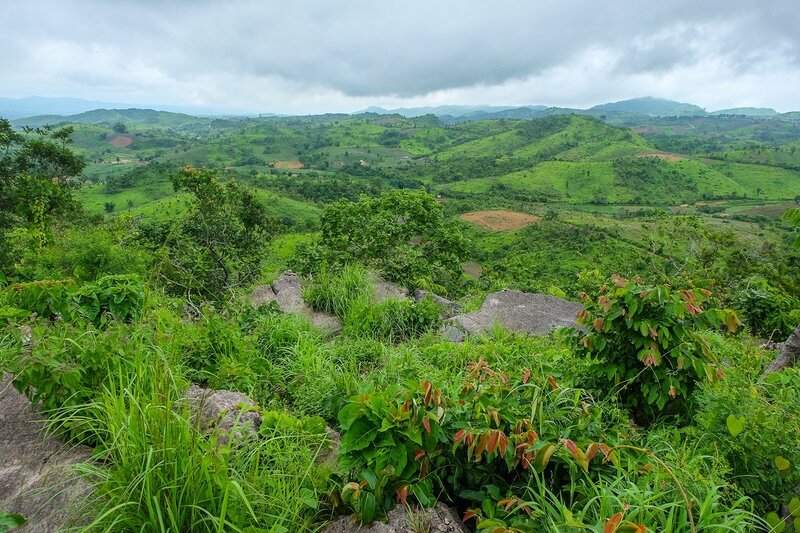 Once you have descended Mount Popa, the tour continues to a local village, where you get to hear a little about the lives of the locals and observe their everyday life. En route to the village, you drive through lush farmland, making brief stops to experience the cottage industry – the production of palm sweets, for example. Along the way, you will probably see women hauling goods about on a yoke over their shoulders, farmers hacking weeds in the fields by hand, and fields that are cultivated using an ox plough. In the local village, you visit the pagoda situated on a small hill, where you can enjoy a beautiful panoramic view of the countryside. The day ends with a sunset boat trip on the Irrawaddy River. 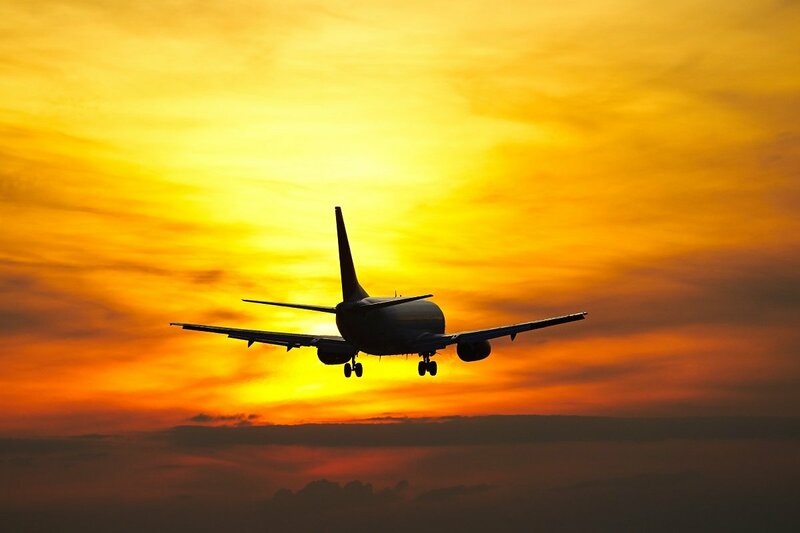 You will be picked up from your hotel and driven to the airport, from which you fly to Heho. In Heho, you will be picked up by a guide, who drives you to Kakku – around a two-hour drive. At roughly the half-way point, you stop in the town of Taunggyi. Taunggyi is located on a mountain top and is mainly a trading post for Chinese and Thai goods being imported to be sold in Yangon and Mandalay. 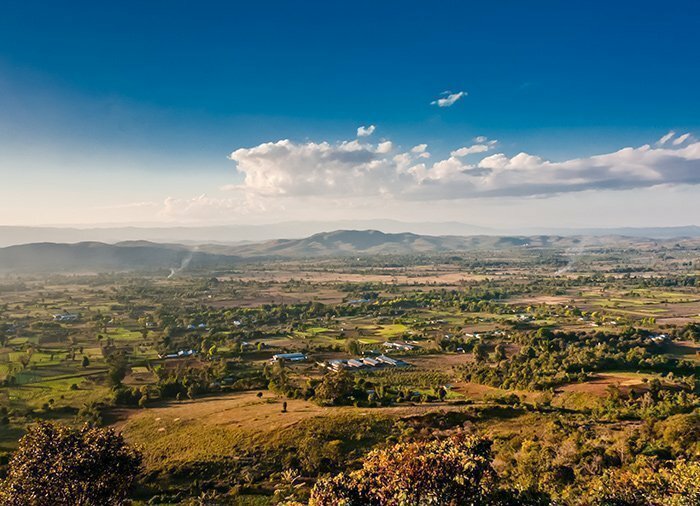 The drive offers outstanding scenery, and as you approach Kakku, you are in no doubt about why it is worth a visit. 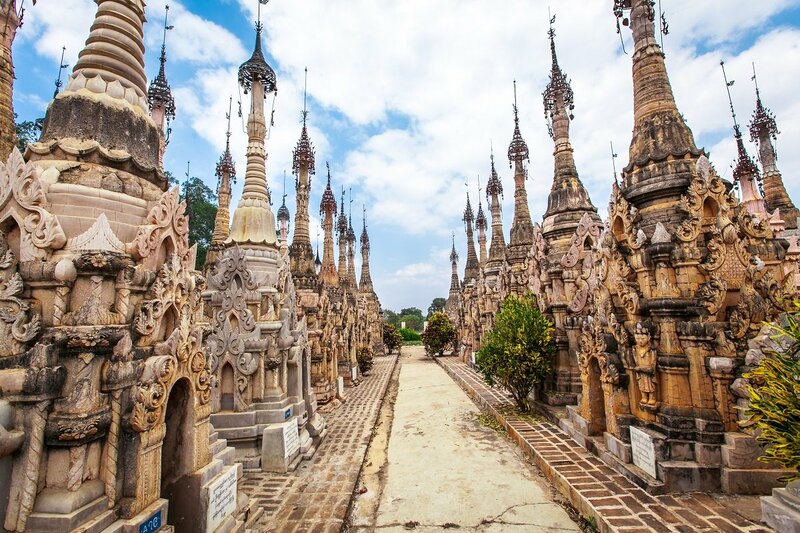 There are more than 5,200 individual stupas in Kakku, some of them more than 20 metres high. The stupas stand in neat rows, some with Buddha statues standing between them, creating a wonderful sense of calm and serenity. 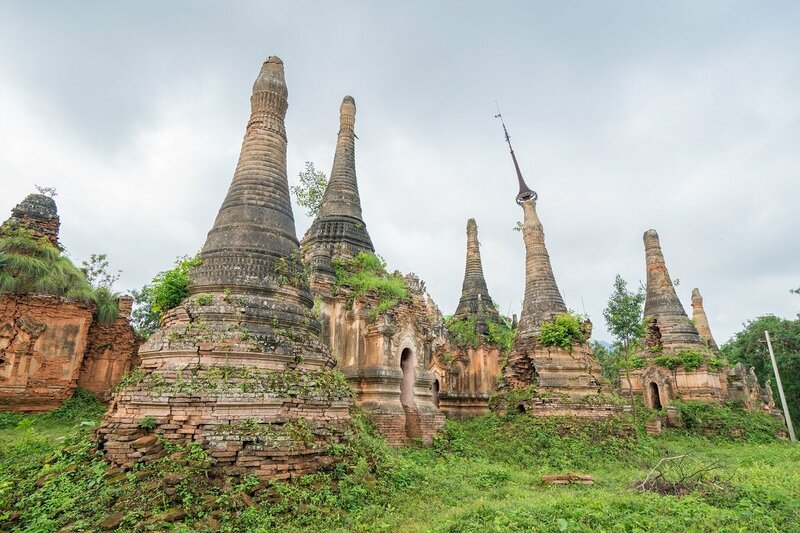 The origin of the stupas is not known, but most can be dated back to the 11th and 13th centuries. You have a little time to wander between the temples and enjoy this impressive wonder. Note in particular the intricate carvings and incredible details of the stupas and statues. You then head to Inle and, time permitting, you will visit the Aye Thar Yar vineyard, Myanmar’s first vineyard which was not established until 1999, along the way. 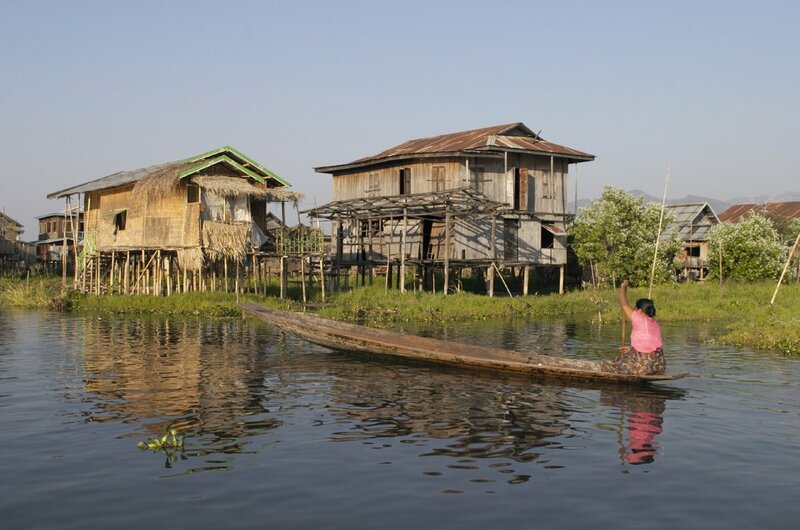 You arrive in Inle Lake, where you will be staying and enjoying experiences in the coming days. 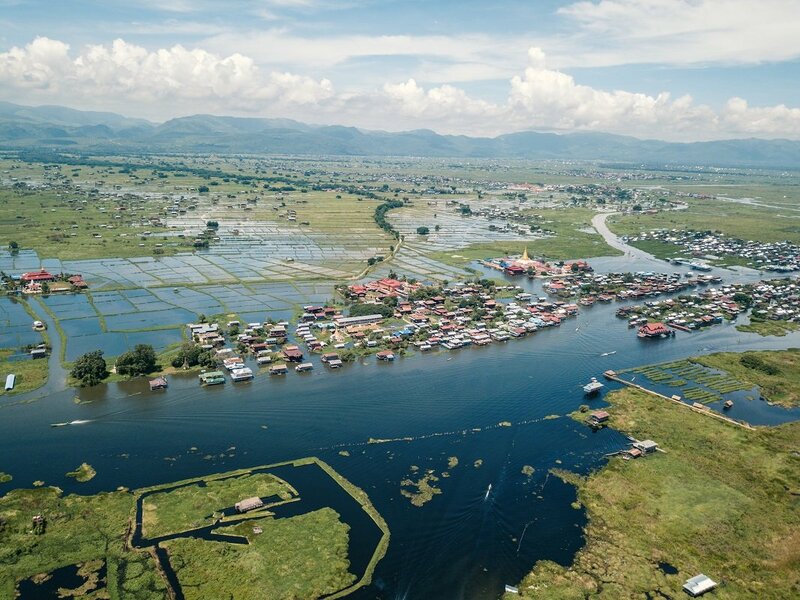 Today, you will be spending the day at Inle Lake, one of the world’s most scenically situated lakes, 900 metres above sea level and surrounded by mountains whichever way you look. The lake is 22 km long and 11 km wide, and the water is almost always still. The lake is very shallow and incredibly rich in nutrients and filled with aquatic plants, which is why you will see fishermen all over the lake using an unusual fishing method as ordinary nets cannot be used. However, the many the aquatic plants are seen as a resource rather than a problem. The plants are actually fished out of the lake and transformed into oblong floating fields up to a metre wide, where the most wonderful vegetables are grown, such as tomatoes, cucumbers, melons and much more besides. And because of all the aquatic plants, the locals propel themselves forward by means of an extremely advanced rowing technique. The person stands on one leg at the back of the canoe with the other leg wrapped around an oar, with which he pushes himself forwards in the water. During your day at the lake, you will see these leg-rowing fishermen as you sail past the floating fields, the villages on stilts, the floating pagoda Phaung Daw Oo, as well as the local silk weavers and lotus weavers. 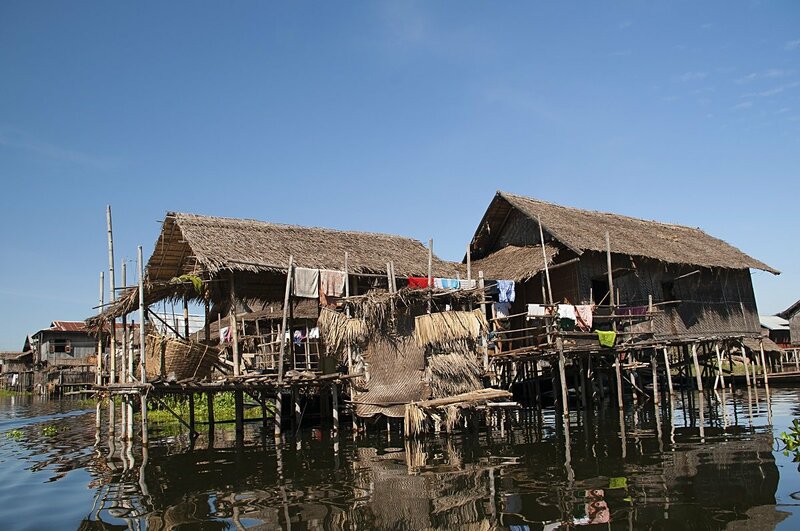 You will also visit the lovely Phao village, Inn Thein, by a small canal leading off Inle Lake, where you will enjoy a small tour of the village on a visit to the local school. 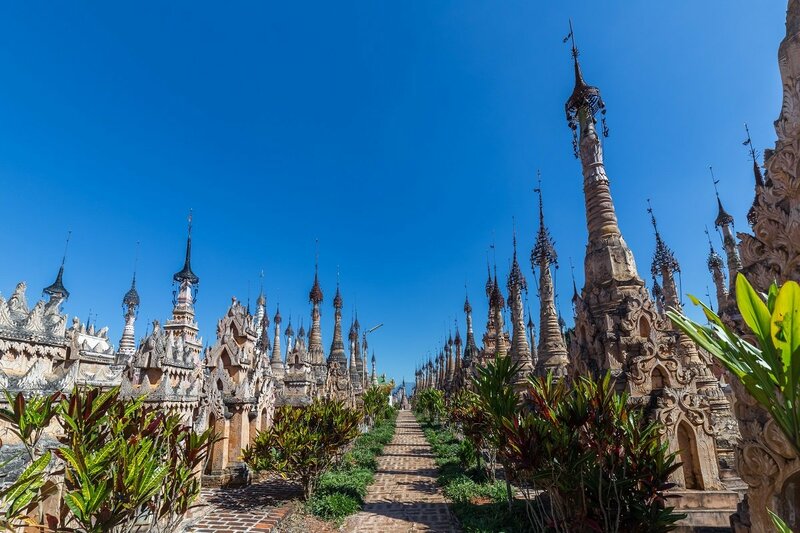 You will also go for a short walk to the Alaung Sitthou area, where the ancient stupas are partially covered in plants, and you enjoy a magnificent view of the lake while walking along a charming bamboo grove. You drive to the airport in Heho and fly to Yangon – a pleasant and leafy city, formerly known as Rangoon. After your arrival, you will be taken to the hotel to check in, after which you will head off on adventure in Yangon. 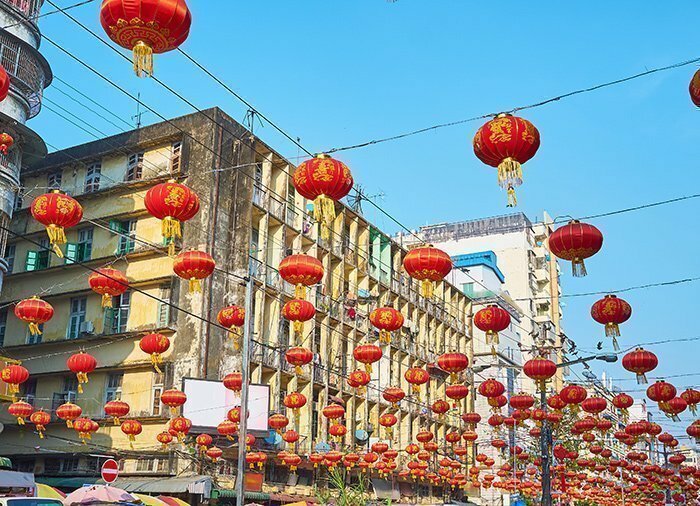 The tour in Yangon offers a ride on the authentic circular train, the city centre and the colonial area, as well as a visit to the famous Bogyoke Market and the city’s Chinatown. 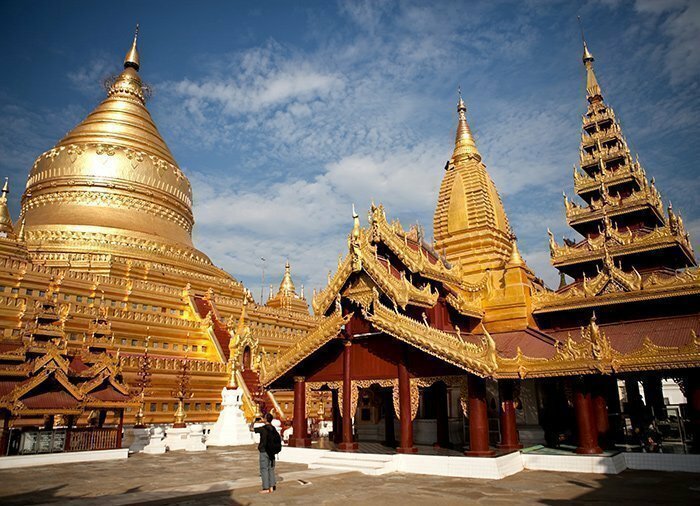 You will also visit the more than 2,000-year-old stupa, Sule Pagoda, and Yangon’s landmark, Shwedagon Pagoda, which is also considered one of the wonders of the world. 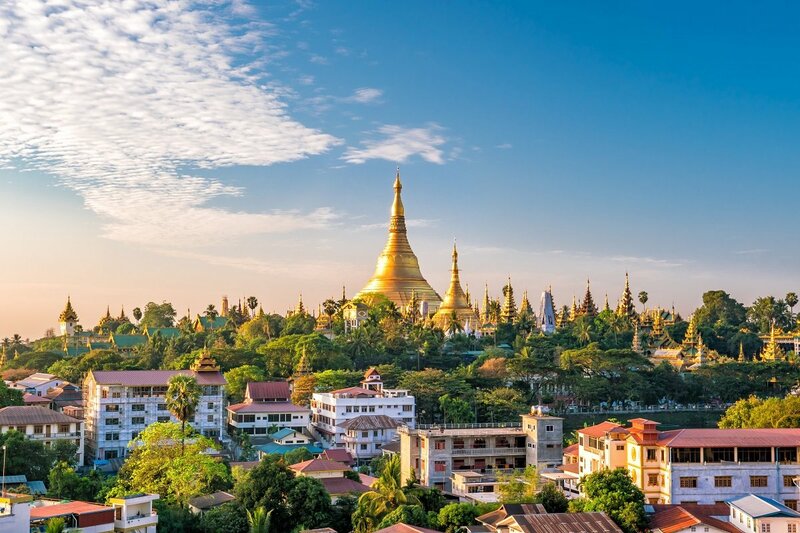 Compared to the rest of South-east Asia, Yangon is unusual in many ways. There are not many skyscrapers here, and the city is very green with many shady trees. From most places in the city, you can, however, see the beautiful gold-plated spire of the tall Shwedagon Pagoda. The 2,500-year-old pagoda is one of the most sacred sites as it is said to house eight sacred strands of Buddha’s hair. Around the pagoda, a unique and breathtaking atmosphere of calm and humility reigns, and if you’re lucky, you will see the Buddhists praying and offering everything from cooked rice and water to flowers. The rest of the day is then yours to do as you please. The day is your own until it’s time to leave. 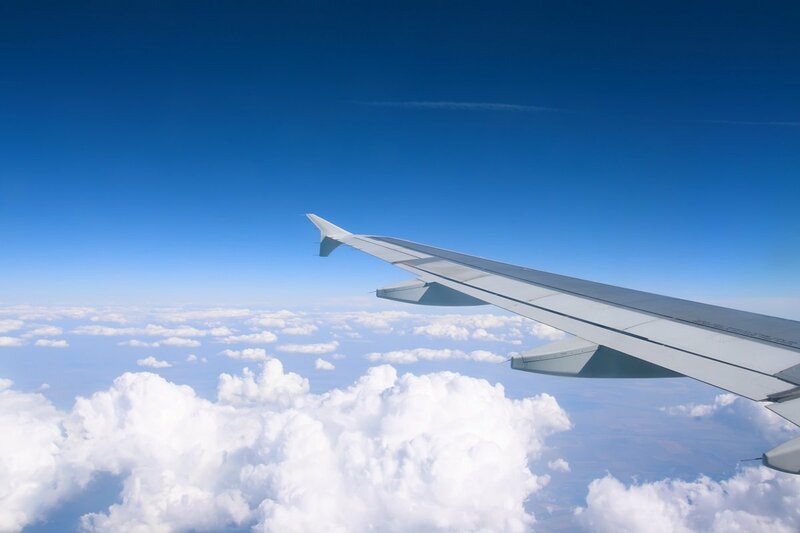 You will be driven to the airport and fly from Yangon to the UK with connecting flight(s) along the way. Arrive back in the UK after a fascinating holiday in Myanmar, packed with wonderful experiences.